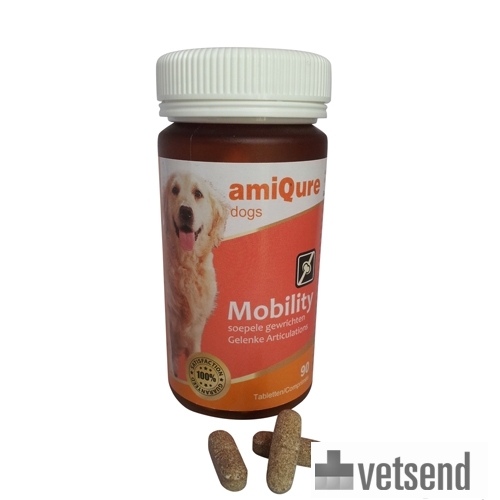 amiQure Mobility is a natural food supplement for the treatment of joint problems in dogs. amiQure Mobility supports the cartilage and the formation of synovial fluid. Joint problems are very common in dogs. About 10% of all dogs suffer from joint issues. It is a misconception that only old or obese dogs suffer with joint problems. They can also be caused by trauma, poor diet, or genetic predisposition. How does amiQure Mobility work? This medicine is based on natural ingredients, which tackle joint problems in several ways. Glucosamine hydrochloride with Vitamin B6, boron, copper, manganese and selenium support the production of cartilage. amiQure Mobility has proven to be effective in research. A study of 44 dog owners found that 86% of the treated dogs were doing (much) better after 6 weeks. Treated dogs had more vitality and were happier. Glucosamine, Hcl, co-factors: Vit. B6, Boron, Copper, Manganese, Selenium, Salix Alba extract, Harpagophytum (Devil's Claw). Give 1 tablet per 7.5 kg of body weight daily. Tablets can be divided, if needed. We recommend giving half the dose in the morning and half in afternoon. A package contains 90 amiQure Mobility dividable tablets. Have you used amiQure Mobility before? Let us know what you think about this product.